As an introduction to the unit Sensational Seasons, the students will explore how an apple tree changes with the seasons. The students will craft apple trees, depicting what the apple tree looks like during each season. The students will be able to identify and label the apple trees according to the season. A Season Graphic Organizer for each of the students, made beforehand. It should include a box divided into four sections. Labels for the students' artwork saying: "fall," "winter," "spring," "summer"
Step 1: Role-play each season by creating a movement. Fall: Pretend the leaves are falling from the sky with your hands in a downward motion. Winter: Pretend to build a snowman and have a snowball fight. Spring: Pretend to be a seed in the ground and begin to blossom into a huge sunflower. Summer: Pretend to build a sandcastle at the beach. 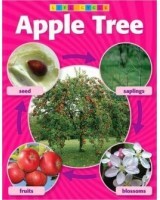 Step 2: Read Apple Tree! Apple Tree! by Mary Blocksma. (You may choose to use any book that has to do with the changes that an apple tree undergoes throughout the year.) I like this story because the illustrations and language are rich with bright colors, rhyming words, and an excellent message about friendship. Step 3: Turn to the page that shows an apple tree in autumn: Write down the students' responses about what the tree and leaves look like on the Season Graphic Organizer (see Lesson Resources, below). Step 4: Turn to the page that shows the winter apple tree: Write down the students' responses about what the tree looks like. 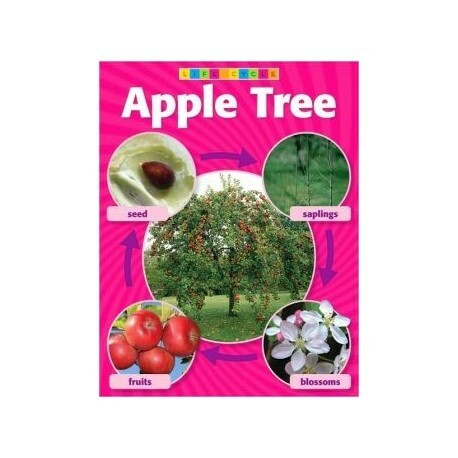 Step 5: Turn to the page that shows the spring apple tree: Write down the students' responses about what the tree and leaves look like. Step 6: Turn to the page that shows the summer apple tree: Write down the students' responses about what the tree and leaves look like. Step 7: Tell the students that they are going to make their seasonal apple trees. Step 8: Have the students go to their seats, where they will fold the brown construction paper in half like a book. Have students lay their non-writing hand and arm on the brown paper to trace (fingers included). This makes the shape of a tree. Repeat, so that each student has traced his or her arm twice on the folded paper, yielding four tree shapes altogether. Step 9: Have children cut out each traced tree shape. Step 10: Have children glue the four brown pieces onto the light blue construction paper. Step 11: Give the students the label that says "fall." Have them glue it to the bottom of the first tree. Step 12: Give each table a handful of yellow, red, orange, brown, and green tissue paper squares. (The colored tissue paper squares represent leaves.) The students may take one tissue paper square at a time, crumble it up, and glue it to the top of the first piece of brown paper. Have the students continue in the same fashion with the other colored tissue paper squares. Encourage students to place some of the tissue squares to look as if they are falling from the tree to the ground. Step 13: Give the students the label that says "winter." Have them glue it to the bottom of the second tree. Step 14: Give each student two cotton balls. Have the students pull the cotton balls apart and glue the cotton to the second tree, as snow. Step 2: Have the students go to their seats and begin the spring apple tree. Step 3: Give the students the label that says "spring." Have them glue it to the bottom of the third tree. Step 4: Give each table a handful of light green, light pink, and hot pink tissue paper squares. (The colored tissue paper squares represent leaves and flower petals.) The students may take one tissue paper square at a time, crumble it up, and glue it to the top of the third piece of brown paper. Have the students continue in the same fashion with the other colored tissue paper squares. Step 5: Give the students the label that says "summer." Have them glue it to the bottom of the last tree. Step 6: Give each table a handful of dark green and red cut tissue paper squares. (The colored tissue squares represent leaves.) The students may take one tissue paper square at a time, crumble it up, and glue it to the top of the tree. Have the students continue in the same fashion with the other colored tissue paper squares. English-language learners: When writing down responses on the Season Graphic Organizer, be sure to draw a picture next to the students' responses. I also have them work on the project with an English only language model. Accelerated students: These students may write one sentence about each of the seasons. Science: Learn about other trees/plants/flowers and how they change as the seasons change. Social Studies: Show pictures of seasons from places all around the country and around the world, showing that the seasons can look different. Math: Tally and graph your students' favorite seasons. Language Arts: Make up a class story about a tree and how the tree changes through the seasons. Have the parents take their child on nature walks throughout the year to notice how his or her environment looks different as the seasons change. Keep notes in a journal. The class may make a larger version of the Season Graphic Organizer to be hung up and labeled. Could the students respond to one part of the Season Graphic Organizer? Could the students follow one- and two-step directions? Could the students stay on task? 4: The student could label and identify all four seasons. 3: The student could label and identify three seasons. 2: The student could label and identify two seasons. 1: The student could label and identify one season.